On this thread there is some tips. Feel free to add your own. Choose a preset, click 'Load' and click 'Convert"
before you click 'Convert' if you're an expert. sound quality is low but acceptable. The file can still be easily edited with mhwaveedit. The file size is very small. The saving of a preset doesn't function very well. but this usually increase the file size noticeably. file to a hard drive. even though they are essentially the same. you can try that setting in mhwaveedit. Let's say you want the audio from a video file. That is easy to do with ffconvert. Just right click on a video file and select ffconvert. It launches. preset. I have selected MP3 Audio ( see image). 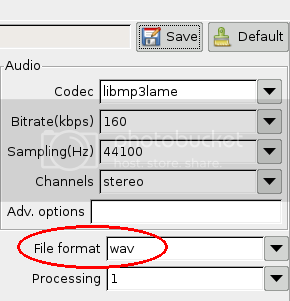 An audio codec (libmp3lame) will now be used when you click 'Convert'. The resulting file is the audio portion of your original file. ffconvert uses ffmpeg to do the conversions. that will make the program fail to convert. programmers use in commands should be avoided. to avoid using the video section. same thing but users maybe confused by that preset. Version 1.3 has a different interface. In the opening window I set my destination folder. the presets from preset config file which has been previously stored. entered in the boxes, making multiple conversion simple.